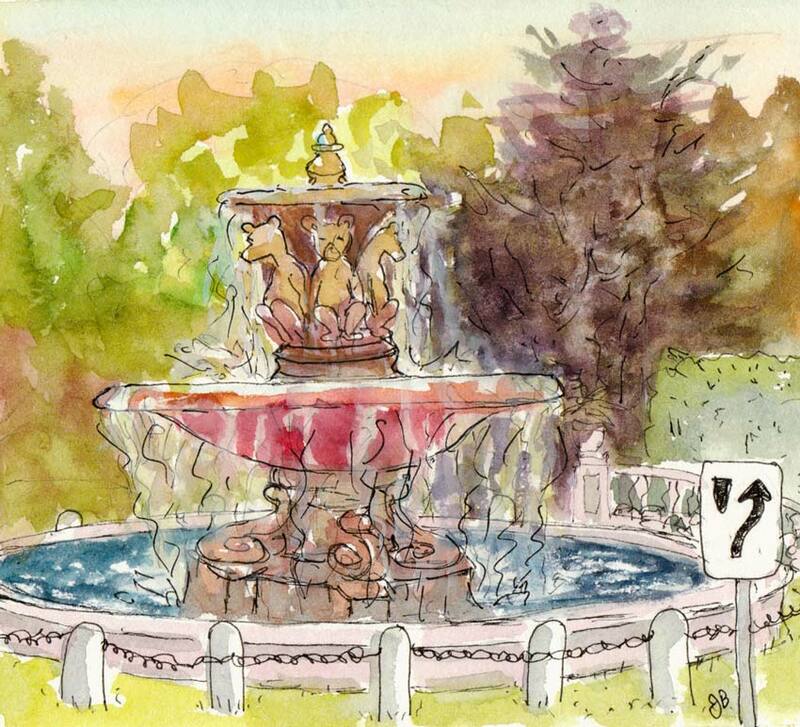 Teddy Bear Fountain, ink & gouache on hot press paper, 6"x4"
Teddy bears hold hands in a circle in this wonderful, historic fountain* in North Berkeley on Marin Circle. We sketched there on a warm Tuesday evening as the sun was setting. I did the one above very quickly at the end of the evening when just as I was about to pack up a worker came and switched on the fountain’s lights and adjusted the water so it sprayed up from the top. I had to give it one more try. Teddy Bear Fountain, ink & gouache, 5 1/2 x6 1/2"
This one was done first and I spent a longer time with it—more than I should have probably, as it began to get overworked. My friend Cathy did several wonderful sketches while we were there, which you can see here. 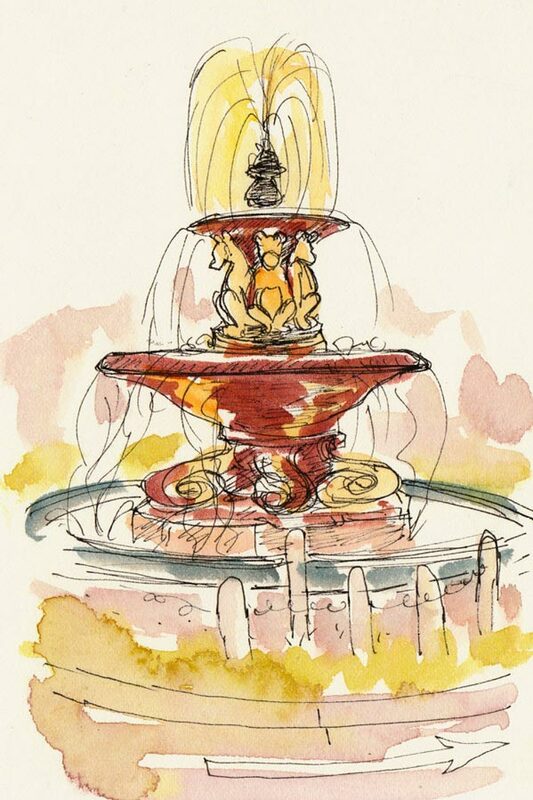 *An interesting bit of history about the fountain: In 1908, a real estate developer came up with the idea to make Berkeley the state capitol and lobbied hard for his proposal. The Circle and the fountain were to be part of a grand entry to the new capitol building to be built nearby. The California Legislature passed the proposal and the governor signed the bill, but Berkeley was a dry city and the liquor lobbyists were successful in convincing the voters to narrowly defeat the bill. Oh, fun, Jana! this Teddy Bear Fountain is a perfect Jana Place. What a wonderful fountain Arthur Putnam created. I love your sketches and will now go over to Urban Sketchers to see Cathy’s. What a wonderful fountain! I love both of them. You are so right about the State Capital project in that area – that’s also why the streets around there are pink cement and the names of some of the streets are county names! They are both wonderful drawings and there’s something really whimsical about the road sign in the second version — in relation to the teddy bear theme and the delight of the fountain.